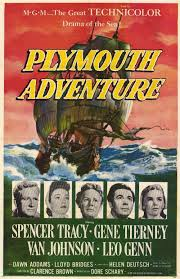 Plymouth Adventure (1952) Rated NR | What to Watch. The dramatic journey of the Pilgrims’ journey to Virginia aboard the Mayflower in 1620, with their unexpected landing in Plymouth, Massachusetts. Based on The Plymouth Adventure 1950 novel by Ernest Gébler. Starring Spencer Tracy, Gene Tierney, Van Johnson, Leo Genn, Barry Jones. Even though this was a box-office bomb, I thought this movie was a great dramatization of the real events of life aboard the Mayflower. For its time, MGM did a fantastic job with the special effects, even if the costumes and make-up look like they are from the 1950’s. I really appreciated the attention to historical details that they incorporated into the film. I think it is worth a watch. This entry was posted in 1952, Adventure, Based on a novel, Drama, films, historical, Movie reviews, movies, Rated NR, Romance and tagged 1620, 1950, Barry Jones, based on, based on the novel, best, books, box office, costumes, Drama, dramatization, English, Ernest Gébler, fifties, film, film reviews, films, Gene Tierney, historical, job, journey, Leo Genn, makeup, Massachusetts, Mayflower, mgm, movie, movie reviews, movies, new world, novel, plymouth, Plymouth Adventure, settlers, special effects, Spencer Tracy, The Plymouth Adventure, trailer, travel, van johnson, Virginia, worth. Bookmark the permalink.